David Cameron has pledged that, if he wins the 2015 election, he will spend the next two years renegotiating the UK’s terms of membership, and then hold a referendum by the end of 2017. The Labour opposition has declined to match this pledge. The UK business community, particularly those involved in trade, is broadly against UK exit from the EU (‘Brexit‘). This reflects the economic consensus, as outlined in a recent CEP study, that exit would do serious harm to the economy (summary, paper). Yet, as I noted recently, sections in the Labour party warn that some of the opposition’s positions appear anti-business. I think events in recent days indicate that the real concern for UK business should be a Conservative victory. When Cameron’s referendum pledge was originally made, I think many regarded it is essentially a short term political device to appease sections within the Conservative Party and UKIP voters. They assumed that UK renegotiation would be a largely symbolic affair, with any concessions the UK received being in practice minor but enough for Cameron to claim something far more substantial. Cameron would then be able to fully recommend staying within the EU, and the referendum would be won. I think that is a reasonable statement of Cameron’s original intentions. The problem with this scenario is that it relies on a deceit: portraying minor changes in EU terms of membership as somehow fundamental. Traditionally a Conservative government can get away with this kind of thing because it has the majority of UK newspapers behind it, and a BBC which is influenced by that press. In this case, however, exactly the opposite will be true. Large sections of the UK press are virulent in their opposition to EU membership. The Juncker affair illustrates the difficulty of the game being played. To attract the UKIP vote, Cameron has to promote the idea that EU membership on current terms is a major problem for the UK. He also seems to think that appearing as the only EU leader prepared to stand up for principles, and portraying his EU colleagues as cowards in the face of German dominance, plays well with the parts of the electorate he wants to win back. So having marched the country to the top of the hill before the election, he has just two years to march them back down again. That will be two years in which large sections of the UK press will be throwing everything they have at achieving the opposite, and where the news will be dominated by this renegotiation. It is possible, of course, that he may actually achieve some major changes to the UK’s terms of membership. But again, the recent episode shows how difficult that will be. It appears as if Merkel changed her mind and supported Juncker as a result of domestic political pressure. Even if she is personally disposed to try and be helpful to Cameron, this experience suggests she will not risk that much to do so. In addition, the more Cameron plays the ‘bulldog battling the EU monolith’ line, the more he builds opposition abroad to ‘giving in to UK blackmail’. Calling potential allies cowards does not seem like a wise thing to do. There must also be risks on the other side. It is said that almost half of all Conservative MPs will campaign to leave the EU. Conservative party activists are likely to be much more anti-EU than MPs, so considerable pressure will be placed on Cameron to tone down his eventual support for a yes vote to stay in the EU. It is conceivable that he might refrain from clearly backing continued EU membership, in frustration with his EU colleagues after two years of negotiation and to keep safe his own position in the party. The current betting is that any referendum will result in a vote to stay in, but the odds are close. What is clear is that a Conservative victory that brings with it a referendum will lead to two years of heightened uncertainty, and what business leaders always say is that they really dislike uncertainty. The risk that the end result will be exit from the EU are considerable, and that would lead to a further period of uncertainty as the UK tries to negotiate favourable trade deals as an outsider. Is all this risk really worth it just to ensure a lower top rate of income tax? In the account of the history of macroeconomic thought I gave here, the New Classical counter revolution was both methodological and ideological in nature. It was successful, I suggested, because too many economists were unhappy with the gulf between the methodology used in much of microeconomics, and the methodology of macroeconomics at the time. I just do not think that is right. Stagflation is very easily explained: you just need an ‘accelerationist’ Phillips curve (i.e. where the coefficient on expected inflation is one), plus a period in which monetary policymakers systematically underestimate the natural rate of unemployment. You do not need rational expectations, or any of the other innovations introduced by New Classical economists. No doubt the inflation of the 1970s made the macroeconomic status quo unattractive. But I do not think the basic appeal of New Classical ideas lay in their better predictive ability. The attraction of rational expectations was not that it explained actual expectations data better than some form of adaptive scheme. Instead it just seemed more consistent with the general idea of rationality that economists used all the time. Ricardian Equivalence was not successful because the data revealed that tax cuts had no impact on consumption - in fact study after study have shown that tax cuts do have a significant impact on consumption. An MP who is a member of the Treasury Select Committee has described the Bank of England as an unreliable boyfriend: “one day hot, one day cold". City economists make similar complaints. The same is frequently said in the US about supposed Fed communication failures. Are these complaints justified? In judging whether a central bank is really ‘blowing hot and cold’, we need to distinguish between public information about the economy on the one hand, and how policymakers will behave given new information on the other (in technical terms, their ‘reactions functions’). If you start flirting with your boyfriend’s best mate, you should not be surprised if he starts going a little cold. If, on the other hand, he had been attentive and considerate until the World Cup started, since when you have been completely ignored, you have probably learnt something about him that you did not know before. The problem is that we cannot know for sure how each MPC or FOMC member will react to new bits of data as they emerge. So when Mark Carney in his Mansion House speech said “There’s already great speculation about the exact timing of the first rate hike and this decision is becoming more balanced.” he could have just been reflecting the fact that recent data had been surprisingly strong. As everyone had seen this data, there was no useful additional information in that statement. However he went on to say “It could happen sooner than markets currently expect.” The intent of that statement is clear. For some reason markets had not reacted to this recent data (and therefore advanced their expectations about when the first rate increase would occur) in the way Mark Carney or the MPC as a whole had done. So they had got the Bank’s reaction function wrong, and Carney was telling them so. This is why the market reacted strongly to Carney’s speech, and Carney intended them to do so. The trick was to reference something tangible - the market’s forecast for when interest rates were likely to rise. But this raises an obvious question. If part of the Bank’s communications strategy is to make comments about market forecasts of interest rates, wouldn’t it be both clearer and more efficient to have the Bank’s own forecast about interest rates. This is a point that ex-Bank economist Tony Yates makes here. It is only a matter of time before the Bank of England does this, and continues in its tradition of following the Fed. One interesting question of detail remains, however. Should the Bank publish a single forecast, or follow the Fed and publish the forecasts of each MPC member? (I give an example of the FOMC ‘blue dots’ in this post.) There are arguments for both. The Bank publishes a forecast for inflation and other aspects of the economy, but only on the basis of market guesses of future rates. 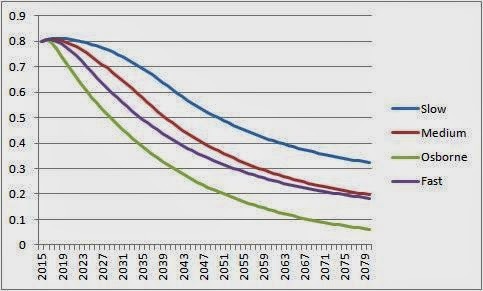 It would be much more efficient and informative to publish forecasts based on the Bank’s best guess about the future path of interest rates. The problem with having just one forecast is illustrated by the Carney speech. Was Carney at the time giving his view, or the view of the MPC? If the latter, how unanimous was that view? If subsequently a member of the MPC says something different, is that consistent with the majority view or a change? This problem becomes particularly acute when new MPC members replace old. Questions such as these can only be answered if individual MPC members give their own personal forecasts, as FOMC members currently do but with, in addition, their names attached. When it comes to monetary policy, we have not one but many ‘boyfriends’. Now boyfriends can get annoyed if you keep asking them ‘what are you thinking’, but in this case we do rely on them (and pay them) rather a lot, so I think we are entitled to know. In a previous post I talked about why it made sense to keep the form of the current government’s fiscal mandate, although the five year rolling target should involve the deficit rather than the cyclically adjusted current balance. But what about actual numbers? I start the analysis in financial year 2015/16, with the OBR’s forecast for headline public sector net borrowing (hereafter the deficit) of 3.8% of GDP. Let us also assume that the debt to GDP ratio at the beginning of that financial year is a nice round 80% (the OBR’s forecast is slightly less). That is the deficit and debt that any new government will inherit. Let us also assume that by that time interest rates are above the Zero Lower Bound (ZLB) and are more likely to rise than fall back to the ZLB. That is by no means certain, and in my view it is critical. If interest rates are still stuck near zero, fiscal policy should be aiming to speed the recovery, not reduce the deficit. A deficit of 3.8% is too high to start bringing public debt down, and the analysis outlined here or here suggests it makes sense to bring debt down. So the key question is simply - how fast should the deficit and debt fall? Economic theory only really tells us one thing on this question: deficit reduction should be fairly slow, if there is no danger of default. So in the table above I look at four possible paths. In the ‘slow’ path, the target for the deficit 5 years ahead made in 2015 would be 3% of GDP. If we make the assumption that long run growth in nominal GDP is 4% a year, then maintaining a 3% deficit would stabilise the debt to GDP ratio at 75% of GDP. I think that is still too high, and for various reasons it is good to plan for a steady fall in the debt to GDP ratio over the next few decades. So the slow adjustment path involves a steady but slow reduction in deficits to 1% of GDP by 2040, which if maintained would eventually stabilise the debt to GDP ratio at 25%. The path of debt, assuming 4% nominal growth each year, is shown below. This ‘slow’ path is much slower than anyone is currently talking about, but I’ve included it just to make the point that it should be an option that is on the table and seriously considered. It gets debt down to a smaller share of GDP than at any time in the UK over the last two hundred years. It may do so too slowly, but it is important to discuss why it is thought to be too slow. The path labelled medium is more ambitious in two respects. First, the five year target made in 2015 is a deficit of 2.4% of GDP rather than 3%, so the pace of deficit reduction from 2015 is more ambitious. Second, the target is an eventual debt to GDP ratio of 12.5% of GDP. So the deficit is steadily reduced to 0.5% of GDP. However both of these paths fail to noticeably reduce debt by 2020 compared to 2015. (With 4% nominal growth, and starting with debt to GDP at 80%, the deficit needs to be below 3.2% for debt to start falling). The ‘quick’ path involves a deficit target of only 1.5% by 2020, and further reductions so that the deficit reaches its steady state level by 2025. However I assume for this path that the desired long run debt level is the same 12.5% of GDP as on the medium path. If public investment stays at around the 1.5% of GDP mark projected by the OBR, then the 2020 figure for the deficit would correspond to achieving current balance by that date. The final path, labelled Osborne, involves the OBR’s forecasts for the deficit under current plans for 2016 and 2017, and a zero deficit thereafter. This brings debt down much more rapidly, and with a zero deficit the debt to GDP ratio steadily tends towards zero. I cannot see any logic to such rapid deficit and debt reduction, so it seems to be a political ruse to either label more reasonable adjustment paths as somehow spendthrift, or to continue to squeeze the welfare state. What it already seems to have done is shift the opposition's position towards the fast adjustment path. Labour’s current commitment is to achieve a current balance surplus as soon as possible, and certainly by 2020. If public investment stays at around 1.5% of GDP, that would correspond to the fast path above or even faster. It is less clear what the LibDem plans would be, either in terms of numbers or rules, although Giles Wilkes suggests here that they are broadly similar to Labour's plans. There is nothing complicated in all this - anyone can produce similar numbers on a spreadsheet. Yet they really matter. As Giles Wilkes and also Steven Toft note, achieving deficits of the kind shown on the fast path will be very painful unless growth is very strong. So where is public debate about which path is more desirable? I guess it went the same way as the public debate over austerity. As Aditya Chakrabortty aptly observes, the fiscal policy debate at Westminster is in danger of becoming like Monty Python's Four Yorkshiremen sketch. Was the neoclassical synthesis unstable? Economics as a science that studies markets is ideologically neutral. Economic theory can be used to support ‘unfettered’ markets, or it can be used to justify interventions to avoid various kinds of market failure. The former means that it will inevitably be used by some to support a laissez-faire ideological position. There are two checks against this one-sided presentation of economic theory: economists presenting alternative theories that embody imperfections, and the use of evidence to show that a particular theory works, either in terms of its assumptions or results. Before considering macroeconomics, take an example from labour economics: the minimum wage. Standard competitive theory suggests a minimum wage will reduce employment and raise unemployment. Card and Krueger undertook a famous study suggesting that in one particular example where the minimum wage was increased there was no reduction in employment. That led to a substantial amount of additional research, much (but by no means all) backing up the result that the impact of moderate increases in the minimum wage on employment was either non-existent or very small. For similar developments in the UK, see this account by Alan Manning. This empirical evidence was sufficient to encourage the development of alternative theoretical models: principally but not only monopsony. So here we see theory and evidence interacting in a Popperian type way, hopefully leading to better theory. Yet with economics there will always be ideological resistance, so there will always be those who want to stick to the basic model and who select those empirical studies that support it. For the discipline to survive, those ideologues have to be a minority. But even if this condition is met, a healthy discipline has to recognise the influence of that minority, rather than try and pretend it does not exist or does not matter. There is a slight twist for macroeconomics. As governments are the monopoly providers of cash, and provide a backstop to the financial system, they are involved in the ‘market’ whether they like it or not. Complete non-intervention is not an option: instead the next best thing (from a laissez-faire point of view) is some kind of ‘neutral’ default policy rule, like keeping the stock of money constant. The Great Depression was the empirical wake-up call (the equivalent of the Card and Krueger study) for macroeconomics. So profound was the impact of this empirical event that it led to a whole new way of doing the subject. Keynesian economics was methodologically different from much of microeconomics: it put much more weight on aggregate evidence (through time series econometrics), and much less on microeconomic theory. One way of putting this is that in the 1960s, general equilibrium theory of the Arrow-Debreu-McKenzie type seemed a complete contrast to what macroeconomists were doing. That an event as powerful as the Great Depression should have had such a profound methodological impact is not really surprising. The Great Depression also meant that those advocating non-intervention had to make an exception of macroeconomics. It was for the generation after the Great Depression abundantly clear that here was a colossal market failure. This is one sense in which the term neo-classical synthesis can be used: to allow the state to combat the market failure represented by Keynesian unemployment (albeit, in the case of Friedman, in as rule like way as possible), but to maintain advocacy of non-intervention elsewhere. Note however that this is a synthesis servicing a particular ideological point of view, rather than being anything inherent within economics as a discipline. Was this ‘ideological synthesis’ tenable among those supporting the ideology? There were two natural tensions. First, the position that macro intervention should be rule based and minimal was contestable. Second and more importantly, as the memory of the Great Depression faded (and neoliberalism spread), the temptation grew to ask ‘do we really have to accept the need for state intervention at the macro level’. However I’m not sure the latter would have become critical had it not been for another tension within macroeconomics itself. What was not tenable from a methodological point of view was the distance between the very empirical orientation of macroeconomics, and the more axiomatic foundation of much of microeconomics. What was required here was a different kind of synthesis, one which allowed for a healthy dialogue between theory and evidence. My impression is that in many areas of microeconomics this happened: that is partly why I gave the minimum wage example, but it is also worth noting that general equilibrium theory lost the primacy that it might once had among microeconomists. But these are impressions, and I’ll happily be corrected. I think the same thing could have happened in macroeconomics. Heterodox economists (and Robert Waldmann) would almost certainly disagree, but I think macroeconomics has gained a great deal from the project to add microfoundations. Where I hope heterodox economists would agree is that a dialogue where theorists engaged with macroeconomics and tried to persuade macroeconomists of the importance of following particular theories would have been healthy. But that was not the way it turned out. What could have been a dialogue of the Popperian kind became instead a theoretical and methodological counter revolution. Instead of asking ‘what can we do to get better microfoundations for sticky prices’, the assertion became ‘without good microfoundations we should ignore sticky prices’. Why was there a counter revolution in macro rather than a Popperian dialogue? I think it is here that the second tension in the ‘ideological synthesis’ I identified above is important. Those who wanted to dispute the need for macro intervention realised that the microfoundations for macro market failures that existed at the time were poor (adaptive expectations in a traditional Phillips curve), and so any macroeconomics based on ‘rigorous’ (textbook, imperfection free) microfoundations would not be Keynesian. They also realised that they could produce models which generated real business cycles which were entirely efficient. These models assumed all unemployment was voluntary, which in any normal science would lead to their rejection, but in an axiomatic based approach where some evidence can be ignored it was acceptable. New Classical economics did not want to improve Keynesian economics, but to overthrow it. It is very difficult to believe this motivation was not ideological. Does the fact that this counter revolution was largely successful among academic macroeconomists imply that the majority of macroeconomists shared this ideological outlook? I suspect not. What New Classical economists succeeded in doing was framing the issue as one where a choice had to be made, between an eclectic empirically orientated approach where theory was weak and empirical methods shaky, and an alternative whose methodological foundations were solidly based within the discipline of economics. So we moved from a position where macroeconomics and Arrow-Debreu-McKenzie seemed worlds apart, to one where at least some see the former arising naturally from the latter. Ironically this happened at the same time as many microeconomists saw Arrow-Debreu-McKenzie as less relevant to what they did. Of course we have moved on from the 1980s. Yet in some respects we have not moved very far. With the counter revolution we swung from one methodological extreme to the other, and we have not moved much since. The admissibility of models still depends on their theoretical consistency rather than consistency with evidence. It is still seen as more important when building models of the business cycle to allow for the endogeneity of labour supply than to allow for involuntary unemployment. What this means is that many macroeconomists who think they are just ‘taking theory seriously’ are in fact applying a particular theoretical view which happens to suit the ideology of the counter revolutionaries. The key to changing that is to first accept it. By Popperian type, I just mean that a theory proves inconsistent with data and so a better theory is developed. The Popperian ideal where one piece of evidence (one black swan) is enough on its own to disprove a theory is never going to apply in economics (if it applies anywhere), because evidence is probabilistic and fragile. There are no black swans in economics. This starts off with some rather specific politics, but we get back to some economics at the end. Let’s take each of those in turn. Inexperienced does not wash: as Rawnsley notes: “He has been a member of the cabinet, which is more than either Tony Blair or David Cameron had been before they became prime minister.” But ‘weak’ also seems inappropriate: as Neil Kinnock points out, he had the courage to take on the Murdoch press when other politicians did not. For those who do not already know why that was a crass thing to do, see here. Go back to those personal failings again. Weak and incapable of being decisive? What could appear more weak and indecisive than trying to appease the Murdoch press that is conducting a campaign against you? 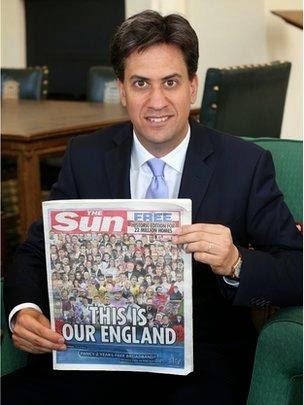 Posing with a copy of the Sun is trivial stuff, but it may be emblematic. What is clearly lacking for Labour at the moment is what those in the US would describe as firing up the base. This is particularly important for Labour, because it is strong among young people, but young people tend to be cynical about politics and less likely to vote. It is why many think David Axelrod has been brought in to help. There is also an obvious issue that can do this job for Labour: inequality. Just as in the US, people think income and wealth should be more equally shared, and their perceptions underestimate how much inequality there actually is. Whether justified or not, high CEO and banker’s pay is not popular. When in government, Labour was strong on measures to tackle poverty, but famously ‘relaxed’ about inequality. For some in the Labour leadership this may have reflected their underlying beliefs, but for others it may have been just a device to distance the party from ‘old Labour’. If the latter, that job has been done. Shadow Chancellor Ed Balls has talked about wanting to see the benefits of growth widely distributed, but if that is a subtle call for less inequality it is way too coded to fire up anyone. Labour, unlike the Conservatives or LibDems, is pledged to restore the 50p top tax rate, but it appears only as a means of getting the deficit down. So why does Miliband not follow Obama and put inequality centre stage? This could achieve the twin goals of rallying those on the left, and appearing strong and decisive. For a possible answer we can go back to Rawnsley again. “There are senior Labour people, and not just of the Blairite persuasion, who think that he has struck too many positions that look ‘anti-business’ and ‘anti-aspirational’. That may well put off some swing voters ….” So the advice Miliband may be receiving is don’t mention inequality, because that might appear anti-business and anti-aspirational. Perhaps the same people have suggested he is photographed posing with some banking CEOs instead? In my drive into Oxford I pass a petrol station that offers a car wash service. Ten or twenty years ago you would have expected this to involve a large degree of automation. However in this particular case it involves a few workers with hoses, mops and buckets. Now anyone who has seen my own car will realise that I know very little about car cleaning technology. But with this caveat, it seems to me this garage offers a nice illustration of how labour productivity is a function of relative prices. If labour becomes expensive relative to capital, it is worth the garage investing in a car washing machine, but if the opposite happens, once the machine reaches the end of its life it goes back to the old labour based technology. In technical terms what I describe above is just an example of factor substitution. This is one explanation of the UK’s productivity puzzle, investigated at the aggregate level by Joao Paulo Pessoa and John Van Reenen. They “argue that ‘capital shallowing’ (i.e. the fall in the capital-labour ratio) could be the main reason for [the productivity puzzle]”. Although initially the US did not see productivity fall, there are indications a milder form of this may be happening there too. So why does this not happen in every recession? One answer, provided by Pessoa and Van Reenen, is that the behaviour of real wages in this recession has been very different. Real wages have been much more responsive to unemployment in this recession compared to the recessions of the 1980s or 1990s. Pessoa and Van Reenen suggest this could be the result of a combination of weaker union power and welfare reforms that keep effective labour supply high even when demand is low. You could also add greater availability of cheap labour from members of the EU where unemployment is high. A counter argument might be that earlier recessions have been caused by tighter monetary policy, pushing up the cost of capital, whereas in the Great Recession interest rates have been at the zero lower bound. However there is evidence that the Great Recession has increased the cost of capital for large firms in the UK, and the impact on small firms will have been even greater. In addition a recession that involves a financial crisis is likely to leave firms feeling particularly reluctant to invest, because any borrowing will involve a long term financial commitment that leaves them more vulnerable. In the past they could have relied on their bank to see them over any temporary cash-flow problems, but now they are less sure. In these circumstances, labour intensive rather than capital intensive forms of production seem much less risky. Indeed in a world of certainty the capital intensive form of production might actually be more efficient. In economic jargon, switching to people with buckets and hoses has actually reduced total factor productivity. But in a world where financial risk has increased, the firm may still choose the labour intensive form of production. This process of factor substitution will also lead to a steady decline in survey measures of excess capacity. As the recession hits, the car wash business with a large machine will report excess capacity as people economise on car cleaning. However when the machine reaches the end of its useful life, it is replaced by people with buckets and hoses, and the firm reports no spare capacity. What happens when demand begins to rise? Initially not much - the firm just hires more labour. Productivity does not increase. The situation becomes more interesting if labour becomes scarce. Does the firm start paying higher wages to attract more workers, or push up prices to choke off additional demand? Or does the firm now think that maybe it is time to invest in a car washing machine, which would in a more certain future allow the firm to reduce costs and prices (and lead to a reversal in the fall in productivity)? Perhaps all of the above. But suppose that at the moment real wages or inflation begin to rise, the central bank tightens monetary policy. This would raise the cost of capital, and could be interpreted as an attempt to prevent real wages rising. In other words, a strong signal to the firm to stick with its labour intensive production methods. We enter a kind of low productivity, low wage trap. Monetary policy, which in theory is just keeping inflation under control, is in fact keeping real wages and productivity low. Monetary policy makers would describe this as unfair and even outlandish. A gradual rise in interest rates, begun before inflation exceeds its target, is designed to maintain a stable environment. As the owners of the garage begin to appreciate this, they will eventually decide to invest in that car washing machine. On the other hand, if they sense that inflation might rise above target, they will not invest, however strong short term growth might be. I’m not sure I believe this. As Chris Dillow argues here, investment may be particularly prone to confidence or animal spirits. Would these animal spirits be stimulated more by strong demand growth, even if it was accompanied by forecasts of 3% or 4% inflation, or by monetary tightening to prevent this inflation ever happening? I also have another concern about a monetary policy which tightens as soon as real wages start increasing. What little I know about economic history suggests an additional dynamic. As long as the firm is employing labour rather than buying a machine, there is no incentive for anyone to improve the productivity of machines. The economy where real wages and labour productivity stay low may also be an economy where innovation slows down. The low productivity economy becomes the low productivity growth economy. Jonathan Portes and I have an article in Prospect, which is a short summary of our discussion paper on fiscal rules (see here or here). In this post I want to use that paper to make two observations on the interaction of politics and economics. Jonathan and I are frequently accused of being against fiscal austerity for political or quasi-political reasons: either we dislike governments that impose austerity, or we want to increase public spending and think that by advocating temporary increases in government investment at the zero lower bound we can achieve this goal. In which case we would obviously reject any fiscal rule formulated by this government, and more generally we would be against any kind of discipline on public debt or deficits. If that is what you think, the Prospect article or the discussion paper will have you scratching your head. After a thorough analysis of the principles behind fiscal rules (on which more below), we conclude that the form of the coalitions current fiscal mandate is about right. It makes sense to have an operational target for the deficit rather than debt, and it makes sense to target that deficit always looking five years ahead. There is one huge caveat, which is that this form of rule is appropriate as long as interest rates are not at, or expected to be at, their zero lower bound. In this recent post I outline what we recommend in our paper should happen in those circumstances, and of course current governments have (since 2010) failed to follow this advice. So our endorsement of the form of the current fiscal mandate only applies to when monetary policy can operate in a normal fashion. Our paper also endorses another innovation of the current UK government: the formation of the OBR. In fact we suggest that it should have additional duties. So these two structural changes brought in by the coalition, the fiscal mandate and the OBR, were positive innovations. The tragedy is that the former was applied in the one circumstance in which it should have been (temporarily) abandoned. Of course the form of the fiscal mandate is different from the actual numbers targeted for the deficit in five years time, and I will talk about those in a subsequent post. We also have some minor suggestions to improve the rule: for example if you are targeting a deficit in five years time when monetary policy is working normally, the target does not need to be cyclically adjusted, and we would target the deficit (actual or primary) rather than the current balance, and have a separate target for the share of public investment in GDP. There is a second sense in which our paper directly addresses the interaction between economics and politics. The way I began thinking about fiscal rules was a standard way macroeconomists think about rules: how close are they to the optimal policy that would be chosen by a benevolent policy maker? This is a perfectly sensible question to ask, but for fiscal policy it is on its own hopelessly incomplete, because we also know that politicians are often not benevolent, in the sense that they act in their own interests rather than in the interests of society as a whole. As a result, we get deficit bias, although this bias may occur for other reasons. The role of fiscal rules is to a large extent to discourage this non-benevolent behaviour. Take the current UK fiscal mandate, for example. An obvious criticism is that, by always targeting the deficit five years ahead, it allows a government to keep putting off making the adjustments required to achieve the target. Don’t worry that the deficit is above target, a government might say, in five years time it will be on target. And it could carry on saying that year after year. In the paper we say that this rule lacks an ‘implementation incentive’. So why not make the target for some fixed date in the future, so adjustments cannot be continually delayed. The problem with a rule of that kind is that it can produce very sub-optimal behaviour as we approach the fixed date. Our macroeconomic theory says that the deficit should be a shock absorber, so having to achieve a target at a fixed date whatever shocks hit the economy could be harmful when unexpected shocks occur near that date. Imagine how much worse austerity would have been if the government had tried to achieve current balance by 2015. Fiscal rules therefore involve a trade-off between optimality and effectiveness in preventing non-benevolent behaviour and deficit bias. The latter depends on a political judgement about policymakers. For the UK, both past evidence and current behaviour suggests that deficit bias is not a huge problem, which is why the rolling five year deficit target can work, but in other countries it might not. This is where a fiscal council like an enhanced OBR can be very useful. Even the more responsible governments are tempted by devices that allow spending today but which shifts costs into the future (PFI in the UK for example). It is very difficult to devise fiscal rules that involve ‘operational targets’ (i.e. targets that a government can try to meet during its term of office) but also prevent such tricks. This is an important reason to do long term fiscal forecasts, undertaken or assessed by independent institutions, which is where the costs of such schemes become evident. However that alone is not enough. A fiscal council like the OBR should also have a duty to clearly alert the public when such tricks are being played. In addition, when targets are flexible so that the implementation incentive is weak (as in the case of a rolling five year target like the UK fiscal mandate), fiscal councils should also judge on behalf of the public whether meeting the target is being delayed for justifiable reasons or not. So the choice of a fiscal rule and the mandate of a fiscal council inevitably involve political as well economic issues. However the politics is more about the transparency and accountability of government, rather than left versus right and associated ideologies. When the current government took over in 2010, the UK economy had begun to recover from the Great Recession. In 2010 Q2, real GDP was about 2% higher than a year earlier. The new government embarked on a programme of enhanced fiscal consolidation (austerity). Growth over the next two years was less than 0.4% at an annual rate. The imminent debt crisis that was supposed to justify austerity never materialised - interest rates on government debt fell significantly. On the face of it, this looks rather bad for the government. So it has been really important for its spin masters to manufacture a consensus that there was no serious alternative to this policy. This has involved three strands. First, that the recession was somehow the result of the previous government’s fiscal profligacy. Second, following on from this, that the government therefore had to ‘clean up the mess’ - austerity was inevitable. Third, that the economic recovery, when it came, was the reward for austerity. The first strand is untenable. Yes, fiscal policy might have been tighter after 2000, particularly if we had known what we know now. But it played no part in causing the Great Recession. The second strand therefore does not follow. Among informed commentators on the UK economy, there is certainly no consensus that austerity was necessary. The third strand is complete and utter nonsense. To suggest that this story is self evident is a lie. So how did the government manage to convince almost everyone to accept the story as true? First, it was vital that other governments were telling similar stories, and that real debt crises were happening not too far way. The idea that the Eurozone crisis is all about fiscal profligacy is equally untrue, but Greece provided the cover. Second, economists in the City tended to go along with the story, in part because it was in the interests of finance to do so. Third, most journalists and newspapers were happy to toe the party line. The occasional eminent journalist or academic would complain, and the Prime Minister revealingly described them as ‘dangerous voices’, but in truth they would only become dangerous if the political class took them seriously. They did not, as we shall see. The ultimate success of the lie was that political opposition to austerity died away. There was just a little tidying up to do for the spin masters. The IMF had originally supported the 2010 austerity programme, but soon began to have doubts. As the economy continued to stagnate, those doubts grew more vocal. The IMF has an authority which really was dangerous. So when everyone, including the IMF, failed to forecast the strength of the 2013 recovery, the spin masters saw their opportunity. Before the 2014 Article IV assessment, they put out the line that the IMF really should apologise to the government for getting its forecast so wrong, and for daring to criticise the need for austerity. Ashoka Mody systematically takes apart the idea that the IMF should apologise. But what was interesting for me was the idea that they should apologise ever got traction in the media. Please correct me if I’m wrong, but I do not remember a BBC interviewer ever asking the Managing Director of the IMF, or anyone else from the IMF for that matter, to apologise to the government before. It was so obviously an idea put out by the government in an attempt to stifle future criticism by the IMF, about policies like Help to Buy for example. The fact that newspapers and then a seasoned political interviewer on the BBC faithfully repeated it shows how dominant the austerity lie has become. If you do not like the sporting metaphors in the post below, you can blame new MPC member Andy Haldane whose speech I have just read. Or maybe the World Cup. When it comes to monetary policy, in recent years the UK has consistently followed the US. The US Fed started reducing interest rates in September 2007, and hit the Zero Lower Bound (ZLB) at the end of 2008. The UK’s MPC started reducing interest rates in October 2008, and hit the ZLB in March 2009. The lag between the two shortened considerably with Quantitative Easing, which the UK started just two months after the US. The MPC also followed the Fed with forward guidance, using a very similar formula. The big question today for monetary policy in both the US and UK is when interest rates will start to increase. Until very recently this looked like a race that neither central bank was keen to enter, at least for a while. But that all changed last week following a speech by UK Governor Mark Carney. That led Gavyn Davies to ask what implications UK hawkishness might have on the US. It is very easy with such things to get lost in the immediacy of each new data release. In this post I’ll try and focus on the fundamentals. Both central banks prioritise price inflation. UK inflation remains comfortably below target at 1.5%. US inflation had been in similar territory. The CPI rose by slightly more than 2% in May, but that is more volatile than the measure the Fed targets, so it is too soon to know whether this represents the beginning of a return of inflation to target. The FOMC committee’s latest forecasts indicate that inflation will remain below target for some time. If the May CPI figure in the US turns out to be a blip, then there appears to be no immediate pressure to raise rates. However interest rate changes take time to feed through to inflation. As a result both central banks would like to start raising rates before rather than after the underlying level of inflation starts to exceed its target. Whether this is a sensible strategy I will discuss later, but it means the focus in both countries is on what determines future price inflation. Here the UK seems to be in the lead, with stronger GDP growth than in the US. However economies often grow very rapidly when emerging from a deep recession. US growth was strong in 2010, but the Fed did not start raising rates then. The US has been growing at a moderate pace ever since, while the UK economy stagnated in 2011 and 2012. With this perspective, the US has not raised rates even after 5 years of recovery, so it seems odd that the UK should raise rates after just two years. Economists would normally say that the more relevant measure for inflation is the output gap: an estimate of how much actual GDP is below the level at which inflation would be stable. Here most estimates suggest the UK is ‘winning’: the latest OECD Economic Outlook estimates for 2014 are UK -1% and US -3.1%. Now output gap estimates should normally be taken with a pinch of salt, but for the UK in recent years this pinch has become a spoonful. Most UK estimates assume that the marked decline in UK productivity growth since the recession (the UK ‘productivity puzzle’) is largely permanent. But as no one has any idea about why this decline has happened (hence puzzle), there is no compelling reason to assume it is permanent rather than reversible. We can make the same point in a very simple way. UK output is currently around the same level as it was in January 2008, while US output is over 6% above its pre-recession peak. This would normally imply that the UK should be following well behind the US in raising rates. What about the labour market? Here is a chart comparing unemployment in both countries. I have taken the OECD’s latest Economic Outlook forecast for the US, but I have used much more optimistic numbers for the UK: 6.4% for 2014, and 5.7% for 2015. (Unemployment in May was 6.6%.) It is true that for unemployment, the lag between the UK recovery and the US recovery is shorter than for GDP growth. 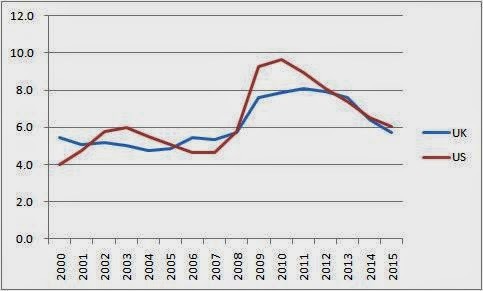 However they seem to be in similar territory at the moment, with unemployment unlikely to return to 2000-2007 numbers by 2015. In addition, there may be more labour market slack than is implied by these numbers, although for different reasons in each country. One final point worth noting is that, with free movement of labour within the EU, any labour market pressure in the UK can be offset by inward migration as long as Eurozone unemployment remains high. There is no indication of any tightening in the labour market in either economy from data on wages. In the US real wages are stagnant, and wage growth in the UK continues to be below price inflation. In the UK, there is even some doubt whether rising real wages would put that much upward pressure on price inflation. Some part of the UK productivity puzzle must be the result of factor substitution: using labour rather than machines because real wages are low relative to the cost of capital. If that is the case, there is scope to reverse this if real wages start to rise, meaning that wage increases are not fully passed on into prices. One area which is often talked about where the UK is well ahead is the housing market, with UK prices rising rapidly. House prices are not part of the consumer prices index, but some argue that they should be. This is problematic conceptually - rents are the price of housing services, and house prices are the price of an asset. As I pointed out here, what we have in the UK at the moment is a rise in house prices relative to rents, which may in turn reflect the combination of falling interest rates and static supply, plus perhaps a bit of froth on top. According to the ONS data, rents have not been rising rapidly since the recession. As John Williams among many others have emphasised, using interest rates to calm the housing market when inflation is below target has proved disastrous for Sweden and Norway. A housing boom is not a reliable indicator of incipient inflation. The UK should certainly not follow the Scandinavian example in this particular respect. Taking all this together, who will be the first to raise rates? My feeling is that US monetary policy makers are on reasonably solid ground, and are not even in their starting blocks. The output gap in the US is sufficiently large that there is little need to start raising rates now. UK monetary policy makers are in a much more difficult place, because of the UK productivity puzzle. The Carney speech has in effect tightened monetary policy by appreciating the exchange rate, as he must have known it would. Before this I had hoped that they would at least wait until real wages started rising significantly, but now I’m less sure. I fear after the Carney speech that they have entered the starting blocks, and any noise might trigger a false start. The problem for the UK is that the strategy of wanting to start raising rates before inflation exceeds the target is inappropriate given the extreme uncertainties implied by the productivity puzzle. As Mark Thoma explains, and I have argued before, the risks are not symmetric. It would be unfortunate if inflation started rising before interest rates started increasing, but the costs of a few years of excess inflation would not be that great. The MPC has after all been there recently, and the world did not come to an end. The costs of prematurely choking off a recovery are much greater when recent productivity and output losses might be recoverable (as they were in the early 1980s and 1990s). These are very strong grounds for the Bank of England to continue to follow the US Fed, and not jump the gun. Postscript: Tony Yates elaborates on this last point, and also has more on the Haldane speech.